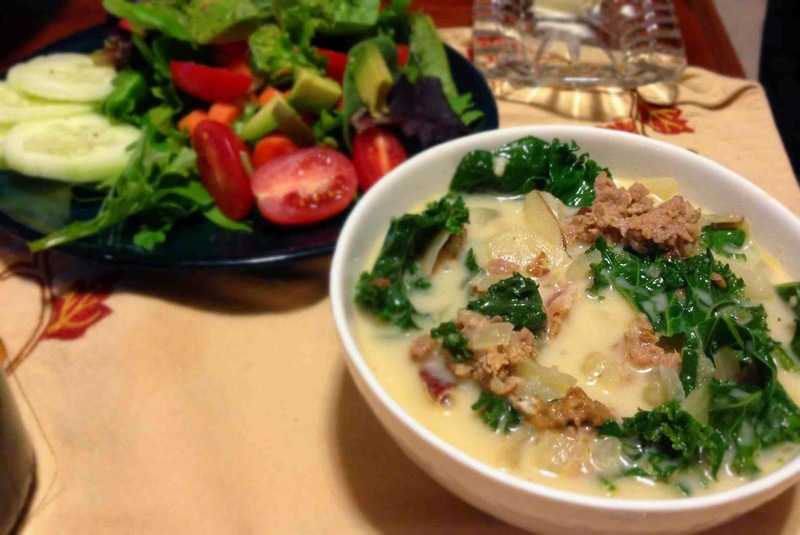 A riff on Olive Garden's zuppa toscana... Italian sausage, potatoes and kale in a milky broth. Yum! What sounds good for dinner when it's nearly 100 degrees out? To Mr. T, hot soup apparently. Or at least that's how he answered my dinner query last week when Sacramento topped out at inhospitably warm temps for the season. And yours truly was excited to throw together a quick and tasty dinner. I followed this recipe, skipping the nutmeg (blech). I added the potatoes midway through and the kale at the very end so it stayed green and had texture rather than mushing out. Delish!